3. Is a “Memorandum of Understanding” or an “Agreement to Use Best Efforts to Negotiate” Legally Binding? Rui Fernandes will be presenting a webinar for the Ontario Trucking Association on the Kruger decision and implications for the trucking industry on April 25th, 2013. In the recent Ontario Court of Appeal decision in Martin v. ConCreate USL Limited Partnership, 2013 ONCA 72 (CanLII), the Court very succinctly summarized the law in Canada regarding restrictive covenants (contractual terms limiting the rights of an employee / seller of a business) regarding non-competition and non-solicitation. In 1990, at the age of 18, Derek Martin (“Martin”) began working as a general labourer for ConCreate USL Ltd. (“ConCreate”), a company owned by Gord Tozer. Over the years, Martin assumed roles of greater responsibility. In the course of the 20 years Derek Martin worked at ConCreate, he acquired a minority interest in ConCreate and a related business, Steel Designed & Fabricators (SDF) Ltd. (“SDF”). The businesses were sold to entities controlled by TriWest Construction Limited Partnership (“TriWest LP”). Martin retained an indirect interest in ConCreate and SDF. In conjunction with the sale, Martin signed restrictive agreements (the “Agreements”) containing similar restrictive covenants in favour of Triwest. Three types of restrictions were the subject of the law suit brought by Martin. Martin applied to the Superior Court for a determination that the restrictive covenants in the Agreements were unenforceable. The application judge dismissed his application. Martin appealed the decision. The central issue in the appeal was whether the duration in the general non-competition covenant in s. 2.1 of the Agreement and a restriction on soliciting employees, customers, dealers, agents or distributors in s. 2.2 of the Agreement was enforceable. A related issue was whether the prohibition on the use of confidential information in the Agreements was enforceable. The following principles of law were set out and summarized by the Court of Appeal, to guide future cases. 1. Covenants in restraint of trade are contrary to public policy because they interfere with individual liberty and the exercise of trade. They are prima facie unenforceable. A covenant will only be upheld if it is reasonable in reference to the interests of the parties concerned and the interests of the public in discouraging restraints on trade. 2. The party that seeks to enforce a restrictive covenant has the onus of demonstrating that the covenants are reasonable as between the parties. The party seeking to avoid enforcement of the covenant bears the onus of demonstrating that it is not reasonable with respect to the public interest. 3. If a covenant is ambiguous, in the sense that what is prohibited is not clear as to activity, time, or geography, it is not possible to demonstrate that it is reasonable. It is therefore unreasonable and unenforceable. 4. The law distinguishes between a restrictive covenant in connection with the sale of a business, and one between an employer and an employee. The former may be required to protect the goodwill sold to the purchaser, and does not usually involve the imbalance of power that exists between employer and employee. Accordingly, a less rigorous test is applied in determining the reasonableness of a restrictive covenant given in connection with the sale of a business. 6. The factors relevant in determining whether a restrictive covenant is reasonable are the same in the contexts of the sale of a business and an employment agreement: the geographic coverage of the covenant, the period of time that it is in effect and the extent of the activity prohibited. Reasonableness is determined in light of the circumstances existing at the time that the covenant was made. Those circumstances include the reasonable expectations of the parties about the future activities and marketplace of the business. The Court of Appeal then reviewed the facts of this case and agreed with the applications judge that the covenants as drafted were not ambiguous. What was left was an analysis as to whether the terms were reasonable in the circumstances. Firstly, the Court looked at the geographic scope. It concluded that the parties envisaged that “the scope of the business was and would be national.” The Court agreed with the applications judge that the geographic scope was reasonable. Secondly, the Court looked at the duration of the non-competition and the non-solicitation terms. The restrictions end 24 months after Martin disposes of his direct or indirect interest in the ownership units of ConCreate and SDF. As part of the sale Martin had kept minor units of both companies. However, Martin’s ability to dispose of the units were restricted by a partnership agreement. Any transfer of the units was subject to required consents of the companies’ lenders, and also required the approval of the board of directors of TriWest Construction (GP) Inc., the general partner of TriWest LP. The Court disagreed with the applications judge that the duration was reasonable. Justice Hoy, speaking for the Court of Appeal, found the duration was unreasonable because it depended on required consents of third parties, and was, therefore, for an indeterminate period, and there was no fixed outside limit. The third parties owed no contractual duty to Martin to act promptly or reasonably. As Martin argued, the lenders may have a commercial interest in limiting Martin’s competition with the respondents. The restrictions in s. 2.2(a) extend to communicating or dealing with any persons who were customers, dealers, agents, or distributors of SDF or Target LP, at the time of the sale transaction or afterwards. Further, the section is drafted in relation to “any products or services that compete with products or services offered by [SDF or Target LP]”, whether or not offered, or planned to be offered, by ConCreate or SDF at the time at the time of the sale transaction. Moreover, the prohibitions are not limited by reference to the “Concreate Business” or “SDF Business”. The restriction is effectively broader than the general non-competition provision and goes far beyond what was properly required to adequately protect the goodwill of the purchased business. Section 2.2(a)’s prohibitions also extend to persons who did not start conducting business with the respondents, and products and services the respondents did not offer, until after Martin ceased to be a director of Target LP’s and TriWest LP’s respective general partners and SDF, and after MartinCo disposed of the Units. The restrictions go beyond what is reasonable to protect the respondents’ interests. Martin would have no basis to know if persons unassociated with the respondents at the time he ceased to have any involvement with SDF and Target LP had since commenced business relations with them. Likewise, Martin cannot be expected to know about every new product or service the respondents offer or plan to offer. This is particularly so given that the section purports to apply to businesses not included in the definitions of “Concreate Business” and “SDF Business”. Lastly, the Court dealt with the prohibition on the use of confidential information. Martin’s argument on the confidentiality argument was that the prohibition in s. 2.3 of the Agreements on his use of “know-how” prevents him from using the wisdom he accumulated over his 20 some years with ConCreate for an unlimited period of time and is therefore unreasonable. The Court of Appeal was not persuaded that this was the effect of s. 2.3. Justice Hoy stated: “While ‘know-how’ is not specifically defined in the Agreements, it is a type of the respondents’ non-public intellectual property (“all non-public intellectual property including trade secrets, unfiled patents….and know-how…). It is reasonable for the respondents to seek to protect their proprietary interests.” The Court made no further comment on this issue. It is unfortunate that the Court did not more fully develop this line of reasoning. Does this mean Martin cannot use any of his accumulated knowledge? Unlikely. Given that he can compete and he can solicit, how will this restriction on using confidential information be applied in relation to “accumulated knowledge?” Questions, we suppose, to be left for another case, another trial. The recently published decision of the Ontario Superior Court in Georgian Windpower Corporation et al v. Stelco Inc. (*1) is an interesting study of the aftermath of a proposed multi-part wind energy project that ultimately never got off of the ground. The parties who were to be involved in the project had entered into extensive negotiations. After a detailed “ramp up” to the intended project, one of the parties decided that that it no longer wanted to participate. The other brought an action for damages for breach of contract, breach of fiduciary duty, breach of confidence and unjust enrichment. The resulting court decision nicely articulates several key principles of the legalities of contract negotiation. The decision considers what duties exist when two parties deal with each other at arm’s length in a commercial context. The plaintiff Georgian Windpower Corporation (“GWC”) came into being in 2003 for the purposes of starting up a wind energy company. GWC in turn formed a wholly owned entity being Nanticoke 80WP Inc. (“Nanticoke 80”). GWC intended that Nanticoke 80 would receive all of the revenue and incur all the costs in relation to the development and operation of a proposed 80 megawatt wind power generation facility on lands owned by the defendant Stelco Inc. (“Stelco”). In 2003 Stelco was a major steelmaker with offices in Hamilton, Ontario. In addition to its steel mill facilities in Hamilton, it also operated a steel mill and related operations on lands owned by it and located on the north shore of Lake Erie in Haldimand County in southwest Ontario (the “Stelco Lands”). Wind energy is converted to electricity using turbines situated on top of large tubular steel towers that are operated by large blades that turn in the wind. The wind towers are located in proximity and are referred to collectively as a “wind farm”. The electrical output generated by each turbine located at the top of each tower is in turn stepped up by transformers and then fed to a substation where it is connected to the Ontario Power Authority “grid”. Wind energy experts who testified at the trial of this matter all confirmed that the development of a wind energy project is both a complicated and time-consuming endeavor. Of primary importance are a sufficient wind resource and a suitable site. The evidence was to the effect that in general, the development phase of a wind energy project takes two years with the construction taking a year thereafter. The development phase involves locating the site, assessing the wind resource on the land, obtaining financing, designing the wind farm and obtaining necessary approvals, including Ontario Power Authority interconnection, community and environmental approvals. In 2003, the wind energy business in Ontario was still very much in its infancy. Governments had just started to subsidize alternative energy projects. GWC came to develop its vision beyond just that of a wind power project to the establishment of a consortium of companies that could ultimately provide 2,200 megawatts of wind energy in Ontario, along with the provision of ongoing technical expertise and the manufacturing capability to design and build alternative energy projects not only in Ontario but around the world. This vision was called the “Industrial Biotricity Strategy” (the “Strategy”). A principal member of GWC came to draft a consortium agreement, and in due course his research lead to the Stelco Lands. These lands seemed to meet all the criteria established for a successful wind energy project. GWC prepared a “briefing package” containing a description of it, its business, a profile of wind energy in Canada and a brief overview of the wind power industry. Members of GWC began speaking with the federal and Ontario governments about the development of wind energy farms and to design, construction and manufacturing firms, all being in the wind power business. By early 2004 representatives of GWC and Stelco met to discuss GWC’s idea of developing a wind energy project on the Stelco Lands. The parties signed a confidentiality agreement. Subsequent meetings occurred. GWC asked for a letter of interest from Stelco that it, GWC, could show to governments and potential consortium members. Stelco provided the letter as to its interest in GWC’s proposed wind power and industrial development on the Stelco Lands. Thereafter GWC engaged wind power consultants for pre-feasibility studies on the viability of the development of the 80MW facility on the Stelco Lands. GWC continued discussions with other potential consortium members including the federal and provincial governments concerning their involvement in the Strategy. A memorandum of understanding (MOU”) was signed in June, 2004 by GWC and Stelco concerning GWC’s plan to develop a large wind-power facility and supporting manufacturing infrastructure in and around the Stelco Lands. The MOU set out the general principles of a multi-part wind power project to be developed on and adjacent to the Stelco Lands. The parties acknowledged in the MOU that the Strategy was at the conceptual stage. Article 4.3 provides that the parties will not pursue other interests related to the endeavor without written permission from the other party or the termination of the MOU in accordance with its terms. Article 5 states that the “Strategy” is at the conceptual stage which it notes are subject to change. … This document is intended to remain in force until (i) either party provides notice of their intention to terminate the agreement or (ii) an agreement between Stelco and GWC is signed covering Stelco and GWC’s relationship in respect to the (Strategy) . To terminate the agreement, either party will be required to provide a notice period of at least sixty (60) days. In the event of termination, each party will be responsible for all costs incurred by them with respect to the development of this (Strategy) up to and including the date of termination. After the MOU was signed, GWC continued to solicit members of the proposed consortium. It also began to focus on the “startup” of the 80 MW land-based wind turbine facility. It accordingly entered into agreements with certain consultants and contractors. As a newly formed company, GWC was short of capital. Its principals provided their time and talents on the understanding that they would be compensated when GWC received sufficient financing in the way of either debt, equity infusion, or both. GWC managed to raise some capital through the sale of shares of Nanticoke 80 with entitlement to flow-through expense provisions as approved by Revenue Canada. This money was used in part for the purchase of the aforementioned initial feasibility study, the purchase of wind measuring equipment and the erection of steel measuring towers on the Stelco Lands. The principals of GWC invested a good deal of time contacting various government agencies, banks and other financing entities to try and raise funds and other consortium partners. It came to be determined that a land use agreement should be negotiated in due course with Stelco in respect of the proposed project. For this purpose, in October of 2004 the parties came to negotiate a document entitled ” Agreement to Establish a Land Lease Easement Agreement Stelco Lake Erie Site”. In April 2005, Stelco sent GWC a letter terminating the MOU and the Agreement to Establish a Land Lease Agreement effective immediately “in accordance with their terms”. The letter also gave notice of Stelco’s desire to “terminate all other contracts, agreements or arrangements arising from any other document in connection with the establishment of a land based wind turbine facility on Stelco’s lands by, in conjunction with or in partnership with GWC”. The termination came as a complete surprise to GWC. GWC brought an action against Stelco, submitting that both the MOU and the Agreement to Establish a Land Lease Agreement created immediate binding obligations on the parties to act with best efforts or in good faith to make the 80 MW Wind Project a reality. By wrongfully terminating the agreements, GWC argued that Stelco breached both its performance obligations and its best efforts and good faith obligations in the agreements. GWC also submitted that in terminating the agreements that Stelco acted in bad faith and that Stelco had owed it a fiduciary duty, which it breached. GWC also submitted that Stelco was in breach of confidence by appropriating the confidential information given to it in respect of the Wind Project and the Strategy. GWC also submitted that, as a result of the breach of contract by Stelco, it lost the chance to develop the 80 MW Wind Project and enjoy the monetary benefits which would be occasioned by it and that it should be compensated accordingly. Finally, GWC asserted that in terminating the MOU and the Agreement to Establish a Land Lease Agreement, Stelco had been unjustly enriched by gaining access to GWC’s plans and estimates, giving it the opportunity to develop the 80 MW Wind Project and other aspects of the Strategy on its own or with others. Stelco submitted that both the MOU and the Agreement to Establish a Land Lease Agreement were unenforceable because they were no more than agreements to agree, that the parties did not intend to create binding agreements and that the parties had also not reached agreement on all “essential terms”. Stelco asserted as an alternative argument that it had validly terminated the agreements in accordance with their terms. Stelco denied that it failed to perform any contractual obligation in good faith, and denied that a fiduciary relationship existed with GWC or that it misappropriated or misused any of GWC’s confidential information. Stelco submitted as a further argument that even if the court found that it was in breach of the MOU or the Agreement to Establish a Land Lease Agreement, that GWC had failed to prove that it suffered any damages. In this regard, Stelco asserted that the contingencies facing GWC’s development of the 80 MW Wind Project, when taken together, led to the inevitable conclusion that the plaintiffs would not have been able to develop the 80 MW Wind Project, let alone receive any profits from it. Stelco also denied that it had been enriched in any way as a result of its relationship with GWC. 1) Do the MOU and the Agreement to Establish a Land Lease Agreement create binding obligations between GWC and Stelco, and, if so, did Stelco breach any of them? 2) Are there good faith / best efforts obligations arising from the agreements which Stelco breached? 3) Did Stelco act in bad faith in terminating the agreements? 4) Did the relationship between GWC and Stelco give rise to a partnership or a fiduciary duty and, if so, was Stelco in breach thereof? 5) Did Stelco commit a breach of confidence? 6) Was Stelco unjustly enriched? 7) If Stelco breached any obligations to GWC, what damages is GWC entitled to? The Court’s analysis of the above issues framed in the action provides an important review of key contract negotiation principles. – a contract is to be interpreted in accordance with the intention of the parties at the time they entered into the agreement, having regard to the words the parties used and the provisions of the contract as a whole (*2). – Regardless of whether the words under consideration are clear and unambiguous on their face or contain some ambiguity, it is permissible, as a part of the interpretive exercise, to consider evidence of the circumstances surrounding the making of the agreement. Such extrinsic evidence has been referred to as to “factual matrix” and involves the origins of the agreement, its purpose and the commercial context in which it was made (*3). What is not admissible in interpreting a contract is the subjective intention of the parties. – it has long been held that agreements to agree or negotiate are not enforceable (*4). The reason why an agreement to negotiate, like an agreement to agree, is unenforceable, is simply because it lacks the necessary certainty. – Agreements providing for future agreement can be binding. If the concept is sufficiently certain to enable agreement, the fact that the agreement provides for future mutual agreement does not result in it being too uncertain if there is a mechanism or formula set out. The issue is whether the provision for the future agreement is directory or mechanical as opposed to the substance of the provision. (*8) The former may therefore still give rise to a binding contract. The latter may not. The above all taken into consideration, the Court found the words of the MOU to be unambiguous. The MOU was primarily an agreement to agree on the development of a proposed large multi-part wind energy project which would involve not only GWC and Stelco but also other parties as well. In this regard, it was merely an agreement to agree and as such is not enforceable. The Court noted that the MOU began with the statement that “it is intended to confirm the general principles pertaining to the ongoing discussions between GWC and Stelco….”. Although the MOU is primarily an agreement to agree in respect of the Strategy, it also contains specific obligations on the parties to facilitate their ongoing discussions in that regard. For example, the parties were not to pursue “other interests” related to the Strategy without permission of the other or to align themselves with interests of others. Noting the “Termination” provision in the MOU, [i.e. that it remains in force until either party provides notice of termination or an agreement is signed covering the GWC and Stelco relationship] the Court found that the “Agreement to Establish a Land Lease Agreement” was not an agreement for the purpose of framing the GWC / Stelco relationship in regards to the “Strategy”. Accordingly, as of April, 2005, the MOU could only be terminated by either party by at least 60 days notice in writing. Stelco’s termination letter failed to give this notice. As a result, Stelco breached this notice requirement. The Court also found that the “Agreement to Establish a Land Lease Agreement” was also clear and unambiguous in only being an agreement to agree to establish a land lease or easement on the site in question. The Court found that this particular agreement lacked the essential terms necessary to constitute an enforceable lease or easement: it failed to provide a description of the demised premises to be leased or the land over which the easement is to run, when the term of either is to commence and lacking certain other material terms incidental to the relationship of landlord and tenant or dominant and servient tenements. The Court noted that the language of this Agreement did not even discern between whether the parties will be entering into a lease, an easement, or both and that this was an election that the parties would have had to have agreed upon for the purposes of the 80 MW Wind Project. Further, the exact land to be utilized on the Stelco Lands had not yet been agreed upon. The Court also found other essential contract terms to be missing having regard to the relationship between the parties and the overall context of the Wind Project vision. The Court however did find that while the “Agreement to Establish a Land Lease Agreement” was unenforceable for the purposes of being a lease or an easement for the use of land, that it did create the obligation on the part of Stelco to allow GWC access to the Stelco Lands for the purposes of wind assessment, it having been GWC’s intention to erect and operate two wind measurement towers for up to a period of 12 months. The Court found that the foregoing analysis was supported by a review of the “factual matrix” as it existed in 2004: GWC was just in the beginning stages of the Project, and all of the experts had agreed that before a wind project could be proceeded with and financing obtained, it was necessary to confirm the wind resource at the site, with at least a year and preferably two years of study. Until the wind resource is confirmed to ensure the project is financially viable, there is no project. In the circumstances, while it makes sense then to find that the parties had committed to a wind assessment being carried out on the Stelco Lands, there was not a binding contract committing Stelco to the lease of or granting of an easement over its lands for the Project. As to GWC’s assertion that both the MOU and the “Agreement to Establish a Land Based Easement Agreement” contained good faith / best efforts obligations on Stelco’s part, the Court ruled that there is no free-standing implied duty of good faith in Canadian contract law that is independent from the terms expressed in a contract or the objectives that emerge from its provisions. (*9). Similarly, an agreement to negotiate in good faith is unenforceable. Citing the Walford decision (*10), “… the concept of a duty to carry on negotiations in good faith is inherently repugnant to the adversarial position of the parties when involved in negotiations”. The Court notes that there is a difference between there being an agreement between parties where one or both have agreed to “use best efforts” to carry out a term of the agreement, and circumstances where the parties have merely agreed to use best efforts to carry out future negotiations. The former creates and modifies a duty; the latter does not. Based on the foregoing review of legal principles and analysis, the Court ruled that Stelco was not in breach of any good faith or best efforts obligations in either the MOU or the “Agreement to Establish a Land Lease Easement Agreement”. The evidence indicated that Stelco terminated the relationship with GWC because it had lost confidence in GWC. While there was no question that the principals behind GWC had worked hard from the inception of GWC to obtain both financing and government support for the Strategy, there remained, as noted above, no independent duty for Stelco to act in good faith. The Court pointed to various features of the evidence that tended to act as a foundation for Stelco’s concerns as to various aspects of the GWC business and methodologies – consistent with Stelco walking away from the project for legitimate concerns and inconsistent with any notion that Stelco ended the relationship because it wanted to take advantage of the proposals and ideas to get financial benefits for itself. In the present case, as the parties were dealing with each other at arm’s length in a commercial context, they are to be considered to have been on equal footing in terms of bargaining power with GWC not being in any way vulnerable to Stelco in the relationship. Accordingly, the Court found that Stelco did not owe GWC a fiduciary duty in their dealings. GWC asserted that during the course of its discussions with Stelco that it provided Stelco with its business plans and financial modeling and plans for the Strategy. There was no evidence that Stelco ever utilized information supplied by GWC in respect of the 80 MW Project or the larger Strategy. The Court in fact found that on the evidence that subsequent to its termination of the relationship that Stelco never used any of GWC’s information. GWC also asserted that by terminating both the MOU and the “Agreement to Establish a Land Lease Easement Agreement” that Stelco has been unjustly enriched by gaining the opportunity to develop the 80 MW Wind Project and other elements of the Strategy either on its own or in partnership with another developer. The Court found that there was no evidence of any enrichment to Stelco during the relationship leading up to the termination or at any point thereafter. On the evidence Stelco did not receive any financial or other benefit from GWC. The evidence also indicated that long before it was first approached by GWC that Stelco was aware that the Stelco Lands were a good location for a wind farm as it had already been approached by developers in that regard. Accordingly, GWC’s claim for unjust enrichment was dismissed. 7) If Stelco breached any obligations to GWC, what damages was GWC entitled to? As noted above, the Court found that Stelco was not liable for damages claimed by GWC based upon lost profits arising from the operation of the 80 MW Wind Project . The Court did however find that GWC was entitled to damages based on the finding that Stelco breached the binding “Termination notice period” obligation in the MOU and the “Agreement to Establish a Land Lease Easement Agreement” by wrongfully terminating the relationship without notice in April of 2005. The evidence, however, did not support a damage claim relating to the lack of 60 days notice of termination by Stelco. There was no indication as to what GWC actually lost with not having the benefit of 60 days notice. In the absence of any evidence of damages, the Court awarded GWC nominal damages of $1,000. The Court had also found that Stelco breached the requirement in terminating the “Agreement to Establish a Land Lease Easement Agreement” to allow GWC to utilize the Stelco Lands for the purpose of wind measurement. The evidence was unclear and hard to discern on the amount of damages caused by this breach. The Court endeavored to determine what costs had been incurred by GWC towards setting up the wind measurement process on the Stelco Lands. The Court assessed these damages at $74,000 apparently based on the “out of pocket” costs incurred by GWC. This case underscores the critical importance of precise and deliberate drafting of language in agreements. In a commercial setting, parties to a negotiation are generally considered to be going into their dealings on a level playing field with their “eyes wide open”. It is important of course that there be an alignment of business interest going into negotiation with the protection of legal rights. In this respect the pen still remains “mightier than the sword”. Recently, there have been two cases that have considered statutory limitation and the ability to “break limits” – one in France and one in Canada. There are statutory limits regarding damages for personal injury, death and property damage for claims, in Canada, falling under the Marine Liability Act, S.C. 2001, c. 6 (“MLA”). The MLA incorporates certain international conventions including the 1976 Convention on Limitation of Liability for Maritime Claims (the “1976 London Convention”). The statutory limits cap the amount available for claimants; that is, once the particular limit is reached regarding any one incident, there are no further funds available regardless of policy limits or number of claimants. Where there are multiple plaintiffs, the limit must be shared, each according to his or her claim and typically via negotiation. A limitation fund may be struck in this regard. The limitations available today are higher than they were under the previous legislation, but they are also harder to “break” or nullify. Previously, the ability to “break” through the statutory limit was easier. The quantum of the limits was, in today’s world, impossibly low and plaintiff could “break” limits by proving that the owner did not come to the table with “clean hands” regarding a variety of factors, including the alleged unseaworthiness of the vessel. Once “broken”, there was no limitation of liability applied and all claims could be litigated regardless of quantum. In a nutshell, as a result of extensive international negotiation, those “impossibly low” limits were replaced by much higher statutory limits of liability. Such higher limits were accepted by the shipping industry in exchange for the certainty of a global limit of liability for potential claims. To gain this certainty, the statutory limits were “hardened” so that they could not be easily “broken” thereby ensuring that the limitation would remain in place for most, in fact nearly all, circumstances. To date there have been few cases to even consider the application of Article 4 to deny the limitation of liability. Essentially, the statutory limit can be eliminated if the defendant can be said to have acted with, essentially, wilful recklessness. In Canada, there have been only two cases considering this issue. Only one of those cases found that the behaviour of the defendant was within the parameters contemplated by Article 4, above. The two cases to consider the matter in Canada are Gundersen v Finn Marine Ltd. 2008 BCSC 1665 and Societe Telus Communications et al v. Peracomo Inc. et al 2012 FCA 199. This article will review only the latter. Internationally, Article 4 of the 1976 London Convention also applies to the various signatories and review of recent case law is instructive. This article will review a recent French case involving “The Heidberg” Cour D’Appel De Bordeaux, January 14 2013 (unpublished). Prior to this appeal decision, the French jurisdiction was known as “claimant friendly” in its approach to maritime claims and its failure to recognize shipowners’ limitation of liability found in the 1976 London Convention. On March 8, 1991, the German flagged vessel “Heidberg” docked in the port of Bordeaux-Bassens to load grain, which was then to be transported to New Holland, Great Britain. After loading, the ship’s Captain set sail accompanied by a river pilot. Through navigational errors, in the wee hours of March 9, 1991, the ship failed to properly manoeuvre through an estuary and moved toward the Pauillac pier of Shell Corporation. Even though steps were taken to reverse direction, the vessel hit and damaged Shell’s pier resulting in an explosion and fire. The cargo was also partly damaged by the water used to extinguish the fire. The M/V Heidberg was arrested and a limitation fund was immediately struck pursuant to the 1976 London Convention. Despite such steps, it took some four years of various court proceedings and much political manoeuvring to release the vessel. There were also criminal proceedings involving allegations of forgery and fraud against the vessel owners, which charges were eventually dismissed after testimony by the German vessel owners. In terms of the civil proceedings, the trial court went on to find that the shipowners could not limit liability on the basis of “undermanning” and damages were assessed at an amount some 25 times greater than the associated limitation. The civil action’s appeal was stayed while the criminal action made its way through the system. The appeal of the trial decision eventually continued and, in 2005, the appeal court found that the shipowners still could not limit their liability on the basis that, although the ship was properly manned, they were at fault because they had failed to ensure that, as between Master and crew, “the confidence and cohesion indispensable to permit them to overcome difficulties which whilst unforeseen were not unforeseeable”. This was an argument not advanced by the plaintiffs nor addressed by the defendants. In October 2007, this decision was overturned and the whole matter sent back for a re-hearing on the basis that the shipowner defendants had not had an opportunity to address the argument. After over 20 years of litigation, in January 2013, the Court of Appeal at Bordeaux found that the 1976 London Convention is applicable to maritime claims. The right of shipowners to limit their liability has also been affirmed. The application of Article 4, as urged by the plaintiffs, was also considered. The Court of Appeal, however, found that the plaintiffs could not “break limits” as the conduct of the shipowners of the “Heidberg” did not fall within the parameters necessary under Article 4 in order to do so. The accident resulted from an error in navigation and the owners could limit liability. Regarding the condition of the vessel, the accident was not found to be as a result of technical failures. The Heidberg was perfectly equipped and conformed to the applicable regulations. Regarding meteorological conditions, none were found that had an effect on navigation. However, the captain was held to have committed multiple navigational errors and failed to take further appropriate navigational measures in the Pauillac passage, known to be a dangerous and delicate navigational challenge. The captain’s decision to leave his post on the bridge to visit the engine room leaving no one in his stead and placing the vessel on autopilot was a concomitant cause of the accident. The plaintiffs further argued that Article 4 should apply because (1) the crew was notoriously incompetent and the shipowner did not nothing to correct it; (2) there was a distrust between crew and captain and the shipowner did nothing to correct this; (3) the shipowner gave no safety/security instructions concerning the organization of work on board the ship and navigation; and (4) the shipowner setup the ship in accordance with the minimum regulations but without adapting the crew or its competence to the requirements for the specific navigation on this trip. However, the Court found, as had the Criminal Appeals court, that the shipowners had conformed to the requisite regulations and that they had met the necessary qualifications with regard to the ship’s crew. The plaintiffs had failed to make out the necessary requirements for Article 4 to apply. The Court held that those who argued that Article 4 should be applied must establish the existence of an act or omission by the shipowners that proved that they actually knew or realized that the damage would probably result. The Court held, in this case, that the shipowners could not have reasonably imagined that an experienced captain would decide, at night, navigating in a dangerous zone of an estuary, and in close proximity to gas and petrol installations, to leave the ship’s bridge, leave it piloted alone, and go to the engine room to engage in certain ballast operations without anyone on watch on the ship’s bridge. Therefore, the Court held that there was no evidence to support the application of Article 4 to deny the shipowners of their limitation of liability as provided by the 1976 London Convention. There is still, however, another route of appeal for the plaintiffs. This case involved the application of statutory limits to a claim for property damage. This case applied Article 4 and the defendants’ the limitation of liability was denied. This is the only case to this author’s knowledge where the limitation of liability was denied by the application of Article 4 and this case has a very unusual set of facts. This matter went to the Federal Court of Appeal and, most recently, the plaintiffs were granted leave to appeal to the Supreme Court of Canada. Mr. Vallee was an individual and sole proprietor and directing mind of Peracomo Inc., the owner/operators of a fishing vessel. One of Societe Telus Communications’ (“Telus”) cables was regularly snagged by the defendants’ vessel while fishing. Mr. Vallee dragged a “brown cable” to the surface of the water and released his snagged anchor. After another snagging occurred a year later and believing it to be abandoned, Mr. Vallee forced the brown cable to the surface and attempted to cut it with a handsaw. When unsuccessful, he then successfully cut it with an electric circular saw. When Mr. Vallee’s anchors later became snagged again, they could be released easily because the cable was severed. Mr. Vallee again cut the cable on another occasion after another snagging and he hauled the cut segment to deeper waters. Telus began looking for the culprit of the vandalism and Mr. Vallee came forward. He was charged with (but acquitted of) committing mischief and wilfully damaging property and interfering with its lawful use. Telus claimed that it had suffered damages in the amount of about $1,000,000 for repairs arising out of the damage to its submarine cables at the bottom of the St. Lawrence River. Peracomo Inc. and Mr. Vallee defended stating that the cables should have been buried and there had been insufficient notice of the existence of the cables. Mr. Vallee had also consulted charts but which charts apparently were outdated. They also claimed the statutory limitation of liability. They also brought claim against their insurer, which had denied coverage based on the described “wilful misconduct”. At trial, the Federal Court found that notice of the existence of the cables was included in notices to mariners, were on current navigational charts and that Mr. Vallee and Peracomo Inc. should have been aware of the cable. The court found that Mr. Vallee had intentionally cut the cable with intention to cause the damage though he thought that the cable would not be repaired. The court found that the loss was a “certainty” and the operator, Mr. Vallee, was “reckless in the extreme”. The court found that, as per Article 4 of the 1976 London Convention, neither the operator, Mr. Vallee, or Peracomo Inc. could limit liability to $500,000 under S. 29 (1) (b) of the MLA. The defendants appealed to the Federal Court of Appeal. The Court of Appeal found that it was open to the trial judge to find that the cable was a navigational hazard within the meaning of the Charts and Nautical Publications Regulations, 1995 and that it was up to the defendants to be aware of the cable’s existence and that they had failed miserably in this regard. The defendants’ vessel had an outdated marine chart and unapproved electronic chart. The defendants argued that Mr. Vallee had sufficient knowledge of safe and efficient navigation that they did not have a duty to have the most up to date charts. The Court of Appeal disagreed stating that Mr. Vallee had no knowledge of the published notices to mariners. The Court of Appeal focused on the fact that Mr. Vallee had notice of the cable through the regular snagging some 7-8 times during a fishing season that had lasted only 8 weeks. He made no inquiries at all regarding the use or nature of the cable even though he knew it was there. He had an obligation to seek further and better information about the cable. The Court of Appeal further stated that it was open to the trial judge to conclude that there was no contributory negligence on the part of Telus and find that the cause of the loss was not the lack of notice by Telus of the existence of the cable to fishing associations or that it was not buried. The fact was that Mr. Vallee could have simply unhooked his anchor as he had done before and without cutting the cable. The defendants further argued that they did not have a duty of care to Telus but the court reminded the parties that the duty of care of ship operators not to damage underwater cables or pipelines has been long recognized. The defendants breached that duty by tampering with the cable before making any inquiries about it. Mr. Vallee had breached his statutory duty under the Regulations and also his common law duty of care to his neighbour below the waterline. The first prong was whether Mr. Vallee had the “intent to cause such loss” and the trial judge found that Mr. Vallee intended the damage. The trial judge did not then consider recklessness as an issue, but that indeed, at paragraph 87 of the judgment, the second prong was satisfied that “such loss was committed with knowledge that the loss would probably result” and in fact was ” a certainty”. The defendants argued that there was no intent by Mr. Vallee to cause damage as he thought that the cable was abandoned, had checked some (outdated) charts and so had no knowledge that monetary loss would result. The Court of Appeal did not agree and stated that the trial judge was clear that the only cause of the loss was the cutting of the cable and the intention to physically damage the cable. The damage was the diminution in value of the cable not the cost of its repair. In fact, the court noted that there is no case law suggesting that “such loss” in Article 4 meant that the perpetrator would have to be aware of the value of the item damaged whether a ship or its cargo etc. The value of the loss was simply irrelevant. The defendants claimed the burden of applying Article 4 was described as a heavy one. The Court of Appeal agreed stating that intention and actual knowledge is difficult to prove but the standard is still one on a balance of probabilities. In this case, the plaintiffs had proven that the defendants’ conduct was committed with “intent to cause such loss” and “with knowledge that such loss would probably result”. Both The Heidberg case from France and the Societe Telus case from Canada are still in the court system and have not yet had their final appeals heard. As it stands, it would appear that the facts will likely have to be very unusual before the limitation of liability under the MLA and/or the 1976 London Convention will be denied. The burden on the party seeking to invoke Article 4 and “break limits” is very heavy indeed. *1 The Heidberg decision has not yet been published. The author wishes to thank Timothy Clemens-Jones of Holman Fenwick Willan, counsel for the owners of The Heidberg, for providing a copy of the Reasons and also to Ajit Singh, one of Fernandes Hearn LLP’s articling students, for his translation of the Reasons into English for her use. *2 www.hfw.com/Limitation-of-Liability-French-Judgment Jan-2013 for review of the case on the Holman Fenwick Willan website for a complete review of the history of the action. This is the second part of a summary and discussion of the recent amendments to the Fisheries Act that were enacted pursuant to last year’s budget bill, C-38. The first round of the amendments, which were the subject of Part 1 of this article (which appeared in Fernandes Hearn LLP’s January 2013 newsletter), took effect on June 29, 2012, while the second round will come into effect at date that is yet to be determined. On March 29, 2012, the Minister of Finance tabled bill C-38, an omnibus budget bill that was titled: “An Act to Implement Certain Provisions of the Budget.” At more than 400 pages, the bill contained more than 700 sections and amended dozens of statutes, including the Fisheries Act, RSC 1985, c. F-14. On June 29, 2012, the act and the amendments therein received Royal Assent and, as such, the amendments became official laws of Canada, subject to their coming into force. As discussed in the first part of this article, despite the bill’s presentation as a legislative housekeeping exercise, the amendments to the Fisheries Act are considerable in their breadth and effect. Further to the first part of this article, rather than having all of the amendments come into force at the same time, the bill was structured such that a first round of amendments came into force immediately following Royal Assent, while the second round of amendments will come into force on a day to be fixed by an order of the Governor in Council, which acts on the advice of the Federal Cabinet. (2) For the purposes of this Act, serious harm to fish is the death of fish or any permanent alteration to, or destruction of, fish habitat. The present version of the Act does not define harm and, as will be discussed below, the definition above is significant in that it excludes all harm below the relatively extreme criteria of death and or permanent destruction to a fish habitat. Whether one appeals to common sense or the perceived purpose of the Act, it is difficult to envision that the narrow definition of harm quoted above captures all of the potential serious harmful activity that the Act should address. As will be discussed below, this narrow definition, together with some of the other definitions addressed herein, has a significant effect on the scope of the Act’s application. The factors enumerated above present a curious balancing of commercial interests versus public/Aboriginal interests. In the context of considering regulations that may be used to authorize activity that is harmful to fish or their habitat, the language of the provision implies that the consideration of the “productivity” of the commercial fishery is to be given equal weighting to the public interest, which one can expect will rile conservationists. In any event, the operative wording of the provision (“the Minister shall consider the following factors”) does not actually limit what the Minister can recommend by way of regulations; rather, it simply mandates what must be considered prior to making such a recommendation. In effect, the obligation imposed by this amendment boils down to a required “checklist” to be completed by the Minister before recommending a regulation, regardless of whether the regulation harmonizes with the factors to be considered. A “fishway” means any device, work or other thing that provides for the free passage of fish, including a canal, a fish pump, a fish ladder, a fish elevator and a fish lock. The provisions in the Act that apply to fishways are set to undergo various revisions, which are mainly technical in nature. Any person or party that has an interest in fishways, commercial or otherwise, should keep an eye out for these pending amendments as they may affect their interests. The reader may recall from Part 1 of this article that, on June 29, 2012, the Act was amended to codify the exceptions to the offence of “killing a fish by any means other than fishing.” Notably, one of the second round amendments will operate to repeal the provision in its entirety. In any event, as will be discussed below, the amendments to the Act (and, in particular, section 35) will operate to enact a general prohibition on activity that causes “serious harm” to fish and/or their habitat. Furthermore, mandatory minimum sentences are included in the subject round of amendments; therefore, the repeal of the subject section will have little to no effect in light of the overall revision of the Act. As discussed in Part 1 of this article, section 35 of the Act, in its present form, restricts conduct that “results in the harmful alteration or disruption, or the destruction, of fish habitat,” subject to certain prescribed exceptions (the most important of which being any activity which is authorized under the Act or its regulations). 35. (1) No person shall carry on any work, undertaking or activity that results in serious harm to fish that are part of a commercial, recreational or Aboriginal fishery, or to fish that support such a fishery (emphasis added). Firstly, it narrows the scope of prohibited activity from that which causes harm generally, to “serious harm” only. As discussed above, “serious harm” is to be defined as “the death of fish or any permanent alteration to, or destruction of, fish habitat.” On its face, an effect of these amendments appears to be the legalization of harm to fish that does not result in death and harm to fish habitat that is not permanent in nature. Secondly, the prohibition on “serious harm” to fish and their habitat only applies “to fish that are part of a commercial, recreational or Aboriginal fishery, or to fish that support such a fishery.” Therefore, it appears that there is no longer a prohibition on harm to fish and their habitat so long as it is not connected to a fishery. By qualifying the prohibition as such, it leaves room for legal activity that causes “serious harm” where the affected fish are not connected to a fishery. For example, if a party were to partake in some activity that caused the death of fish and the complete destruction of their habitat in a remote lake in the Northwest Territories, it would not constitute a breach of section 35 if those fish were not part of a fishery, nor did they support such a fishery. Given the broad scope of interpretation afforded by the phrase “fish that are part of a […] fishery, or to fish that support such a fishery,” the exact meaning and effect of the provision will remain unknown until further advice of the legislature or such a time that a Court may give consideration to the issue (as the author suspects it will in light of the mandatory minimum sentences that will accompany a section 35 offence). As discussed in Part 1 of this article, section 37 of the Act sets out the circumstances and process by which a person, whom “carries on or proposes to carry any work or undertaking that results or is likely to result” in either the destruction of a fish habitat or the discharge of a prohibited substance in water frequented by a fish, must provide the Minister with a plan in connection with same. The plan must include of all information necessary for the Minister to determine whether or not he or she should exercise his or her powers to prohibit or authorize the conduct that is the subject of the plan. The upcoming round of amendments will narrow the application of section 37 from governing conduct that causes harm generally to only that conduct that causes “serious harm.” Therefore, those persons conducting or planning on conducting activity that harms fish although which does not result in the death of fish or the complete destruction of their habitat will be exempt from the requirement that a plan be submitted to the Minister. The upcoming round of amendments will introduce a sweeping series of changes to the offence provisions under the Act and, specifically, the penalties attached thereto. 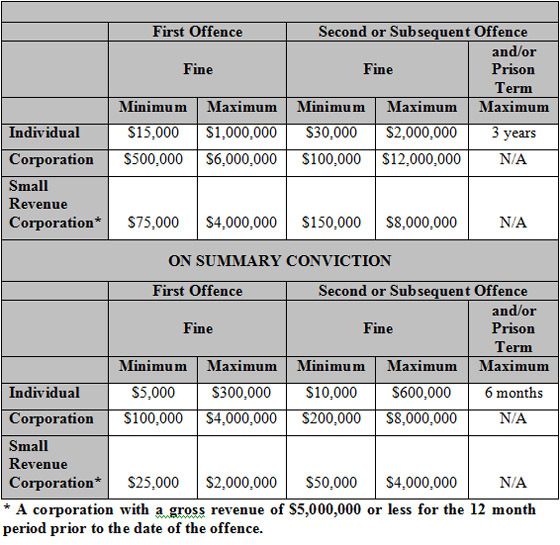 The subject amendments will introduce a series of mandatory minimum sentences together with revised maximum sentences. The sentences will vary depending on the identity of the person that committed said offence (i.e. person versus corporation) and the nature of the charge laid (summary conviction versus indictable conviction). Further to the discussion above, breaching the prohibition on serious harm as set out in Section 35 is one of the major offences enacted by the legislation. These sentences will also apply to pollution offences under the Act (see section 36). (5) The Governor in Council may make regulations exempting any Canadian fisheries waters from the application of sections 20, 21 and 35 and subsection 38(4) (emphasis added). The magnitude of the authority granted by this provision is enormous as it permits the Federal Cabinet to pass regulations that exempt prescribed geographic areas of Canadian waters from certain provision, the most important of which is section 35, being the prohibition on serious harm to fish and/or their habitat. This is remarkable in that the protection of Canada’s fisheries, being the core subject matter of the legislation, can be shelved at the discretion of Cabinet. By way of contrast, the Minister of Fisheries & Oceans does not even have the legislative power to take such action. 1) There appears to be a policy movement away from express codification of prohibited activity to a system more-heavily reliant on discretionary regulation, wherein much of the Act’s application is subject to the discretion of the Minster and/or the Federal Cabinet, via the Governor in Council. Whether this is a good or a bad thing depends on your faith in the Minister and the Federal Cabinet and, in any event, it is understandable why environmental/conservationist interests are nervous about the changes. 2) The upcoming amendments represent a massive scaling-back of the application of the Act insomuch that much of its present animus is directed at prohibiting harmful activity to fisheries; the core of which will be emasculated by the “gutting” of its prohibition on harmful activity to fish and their habitat. Moreover, the prohibition on harm is worded broadly such that its meaning is arguably ambiguous, which presents a legal powder-keg when paired with strict liability and a mandatory minimum sentence. *1. In fact, the author was only able to locate one reported decision whereby a party was even charged with the offence, let alone convicted of same: R. v. British Columbia Hydro and Power Authority,  B.C.J. No. 1744 (BSSC). *2. R. v. Sault Ste. Marie,  2 SCR 1299, p. 1310.